ATV Trails Open In 60 Days! Club Survey - It’s hard to believe but the club is 5 years old this year! We sent out a short, 10-question survey to all members to see what they like about the club and what they’d like to see us do in the future. We’ll share the results at our spring meeting/pancake breakfast. Thanks to everyone who took the survey. If you haven’t taken it, please do. 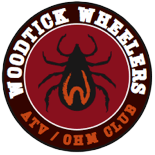 You just need to go to your email list, find one sent on February 9 titled “Woodtick Wheelers Member Survey”, open the email and click on the link. That will take you to the survey. 168 Comments To DNR! -- Thanks to everyone who submitted a comment to the DNR during the 30-day public comment period for our ATV/OHM Trail proposal. The DNR received 168 comments from our club and others! Comments in favor of the trail: 145. Comments with concerns: 23. We reviewed the comments at a meeting with the DNR and county. One major issue: since we started this project, Whipholt Beach Road that goes from Huddles to the beach has changed from a county road to a township road. Pine Lake Township still supports the trail, but does not want the dirt road to be part of a designated ATV trail. The Trail Team is looking at our options and will report on it at the spring meeting. Club Volunteers At Back To Hack - Eight hearty Woodticks helped at Back to Hack, Hackensack’s Winter Festival, by monitoring the Saturday morning walk/run. And it was cold! Thanks volunteers! WCCO News featured Hackensack and Back To Hack that week. Club Buys Youth ATV, Looking For Youth Dirt Bike - We picked up our new 2014 Polaris Outlaw 90 ATV, purchased with a Polaris TRAILS grant. We’re also planning to buy a new or used dirt bike. Let us know if you see one for sale. They will be a great addition to our Safety Education Trailer, attracting kids to the trailer so we can talk to them and their parents about safe riding. Thanks Polaris! And thanks Walker Power for a great price on the youth ATV! More Kids ATV Safety Coloring Books & Crayons -- We used some money from our Trail Ambassador grant to order another 2,000 Adventure Trail activity books from NOHVCC. We’ll be distributing them to restaurants, chamber offices and businesses in the area as part of our ongoing effort to encourage safe, responsible riding of ATVs. Youth ATV Safety Classes Help Lower Accidents and Fatalities -- A report from the MN DNR shows that in 2013, there were 12 ATV-related fatalities, 11 on Class I ATVs and 1 on a Class II ATV (side-by-side). Every one is tragic. Unfortunately, none of the individuals involved had ATV Safety Certificates. Most involved adults and machine roll-overs. Only 2 were under 16 years of age, which the DNR attributes to Minnesota’s successful youth ATV safety education program, one of the best in the nation. To see the DNR report, go to this link:http://www.dnr.state.mn.us/enforcement/incidentreports/index.html. Want to be more involved in trail building? Come to the ATVAM Region 3 All- Club Meeting - For the third year in a row, our club is organizing a meeting of all the ATVAM clubs in Region 3 (9 counties, 13 clubs). It’s a great meeting, with folks from MN DNR and county land departments, where clubs show their trail projects and discuss common challenges and opportunities, and get trail updates from the DNR. Our club usually has a half dozen members attend. If you’d like to get more involved with trail projects, and learn what’s coming from clubs, the DNR and ATVAM, this is a great opportunity, so please join us. The 3rd annual Region 3 all-club meeting is Saturday, March 29, 9am-1pm, at the Crooked Lake Town Hall in Outing. Questions? Call Dave Halsey at 612-723-1987. The club sold over $150 in merchandise over the holidays. Thanks everyone! See club web site for gear and prices. We’re happy to mail it, or pick up a shirt and cap at the spring meeting. 2014 Meetings & Events being planned. One of the top comments in our survey was that members want more club rides, including an overnight ride on the North Shore. Watch for future emails with our schedule of club events for the coming riding season, that starts May 1. Watch our web site and Facebook page for more news, photos and updates! Thanks for your support! Send us your comments and fun club ideas for rides and events! Only 2 months till the ATV and OHM trails open! Watch for a future email with details on our spring meeting/pancake breakfast!